The Centers for Disease Control and Prevention published Tuesday a study that reveals that children affected by Zika inside the uterus can develop microcephaly after being born. The research shows that even when the baby has an average sized head at the moment of birth, the child can still suffer the consequences of the virus, developing a small head and other brain abnormalities consistent with congenital Zika syndrome. Microcephaly is a genetic malformation that doesn’t let the baby’s head to fully grow, causing the child several brain conditions, including seizures. The most notorious side effect of Zika virus was believed to be evident in the fetus growth, but the recent study shows that babies can develop microcephaly after months of being born. The study was performed in Brazil with the U.S. collaboration. It included data from 13 infants from the Brazilian states of Pernambuco and Ceará that were born with a normal size head and laboratory evidence of congenital Zika virus infection. After several analyses, it was proven that eleven of the 13 infants of the study had brain abnormalities related to congenital Zika, including decreased brain volume and ventriculomegaly, which develops more liquid in the skull that compresses the brain. The babies also had subcortical calcification -calcified parts of the brain that no longer function- and cortical malformation, which affects cognitive functions. The infants included in the study had a decelerated head growth as early as five months of age. Eleven of the participants had microcephaly when the study was concluded. The absence of the malformation at birth does not mean that the baby, if exposed to Zika during pregnancy, will not suffer the congenital effects of the virus, including brain abnormalities. The infants considered in the study were born between October 2015 and January 2016 with a standard sized head. They all were diagnosed with congenital Zika virus, and the mothers were questioned about whether they recalled having a rash during pregnancy. Maternal testing to confirmed the women had Zika when pregnant was not available. Six of the 13 mothers described a skin rash between the second and the six months of pregnancy. After selecting the infants for the research, the babies -nine males and four females- were evaluated by multidisciplinary teams at two referral centers in Brazil: the Rehabilitation Center of Association for Assistance of Disabled Children of Pernambuco State and the Infantil Albert Sabin Hospital, Fortaleza, Ceará State. The studies were performed for a year, between October 2015 and October 2016. Eleven of the newborn came to clinical attention because their heads were below the level established by the Brazilian Ministry of Health, although not as small to be immediately diagnosed with microcephaly. The other two babies had an average head circumference, but after the ages of five and seven months, they had to undergo neurological evaluation due to development concerns. Besides Zika, other diseases can cause microcephaly. To make sure the brain abnormalities evidenced in the infants were a side effect of the Zika virus, the babies were tested for other five infections including toxoplasmosis, cytomegalovirus, rubella, syphilis and human immunodeficiency virus. The results were negative for the other disease and only positive for Zika. All babies in the study had clinical neurologic and orthopedic evaluations, and brain imaging with computerized tomography (CT) scan without contrast, magnetic resonance imaging (MRI) without contrast, or both, and radiographs of the hips to identify congenital dislocation, a symptom also related to Zika. The tests began on day two of being born, the study reports. The multidisciplinary tests showed that six infants developed craniofacial disproportion, meaning the babies’ heads had a malformation. Other three infants in the study had excess skin on the scalp at birth, and other three had hip dysplasia, a misalignment of the hip joint, common in babies with congenital Zika. Along with decreases in the rate of the head growth, the babies had significant neurologic dysfunction including hypertonia -more tone in the muscles than they should have- and hemiparesis -weakness in the entire left or right side of the body. They also suffered dysphagia- difficulty to swallow- and epilepsy, a common symptom in brain abnormalities. 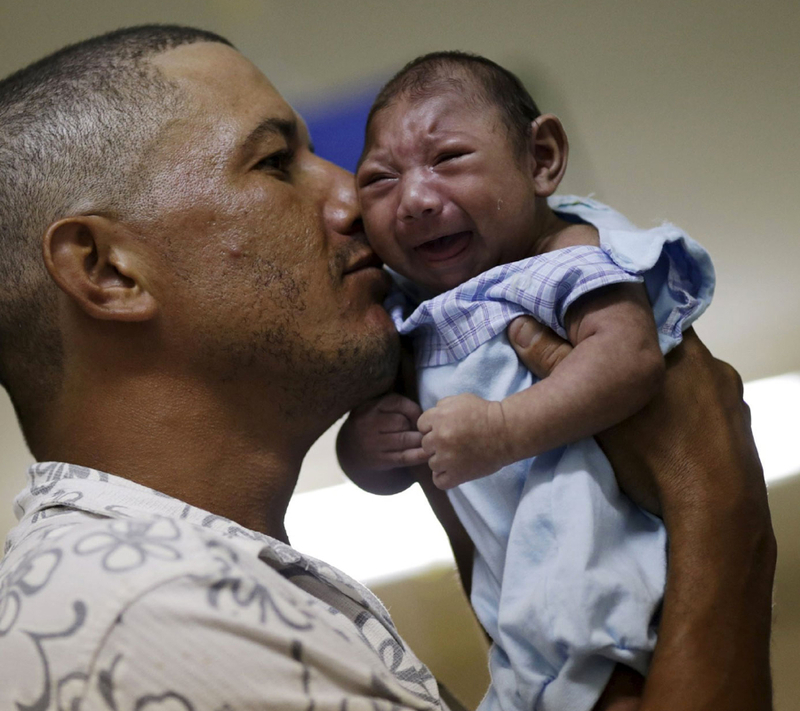 The study is the first one to document babies with congenital Zika signs and symptoms, although the possibility of babies being born without microcephaly and then developing the condition was already known. The research could prove that infants can develop brain abnormalities related to Zika virus in spite of being born with no physical signs of malformation. Due to the reduced size of the sample taking into consideration in the study, the prevalence of congenital Zika syndrome without microcephaly in any population cannot be estimated. But some differences were found in those infants that are born with the syndrome. First, the study points out that the mothers that did experienced rash during pregnancy, assuming it was the Zika virus, felted it in the first months of pregnancy. This evidence suggests that the earlier the virus is contracted by the mother during pregnancy, the more chances the baby has to be born with no visible signs or symptoms of the congenital syndrome. An interesting difference found between infants born with brain abnormalities and those that develop them after birth was that the last group showed better social interactions. The 13 babies group were capable of held eye contact and had a social smile compared to those infants born with microcephaly. Additional information and more studies are needed to determine if getting infected with Zika in the earlier months of pregnancy causes infants have mild brain abnormalities related to congenital Zika syndrome. But what is cleared is that babies born with an average head are not safe from the side effects of Zika.